rif bought me a Banana Cream Pie from Just Heavenly Pleasures last night. The pie crust was thick, crumbly and crunchy. I liked that they used biscuits as the pie base instead of the conventional shortcrust pastry. 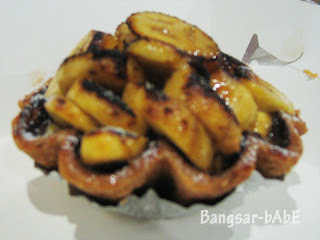 There’s a layer of chocolate on the crust beneath the fresh custard, cream and bananas dusted beautifully with icing sugar. 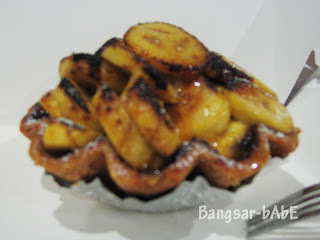 The custard wasn’t too sweet and complimented the caramelized bananas beautifully.